100 Bikes. 100 Miles. We Spin, Kids Win. A benefit for the Harold Robinson Foundation. Click to learn more about the Harold Robinson Foundation. Together we hope to raise $1 million to send under-served kids to camp! It is the vision of the Harold Robinson Foundation to provide a level playing field for our marginalized community's kids, schools and families. We utilize camp programs as a vehicle for empowerment and change. 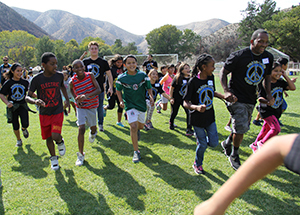 At Camp Ubuntu, children get the opportunity to experience nature, play, sports, use team-work, learn goal-setting, eat nutritious food and receive mentorship from exceptional counselors and volunteers. These programs are designed to strengthen confidence and independence, build character and develop leadership skills. In addition to our Camp Ubuntu sleep away camps, the Harold Robinson Foundation brings Camp Ubuntu Watts a summer day camp to Markham Middle School. It also provides parenting workshops and other programs that help positively build community. In support of this foundation, I am participating in the Pedal on the Pier fundraiser. My team will collectively ride (in place) on a stationary bike for 5 hours on the Santa Monica Pier on Sunday, June 2, 2019. We would be most grateful if you could support our efforts with a tax-deductible donation of ANY size. Thank you for supporting our effort in trying to make a difference in a child's life.